Pull customer information from Highrise and see it as a comment on the ticket with a link to the Highrise page. Update the customer information in Highrise whenever there is a new ticket. Check this option if you want us to create a new contact in Highrise if we can't find one based on the email address of the customer. 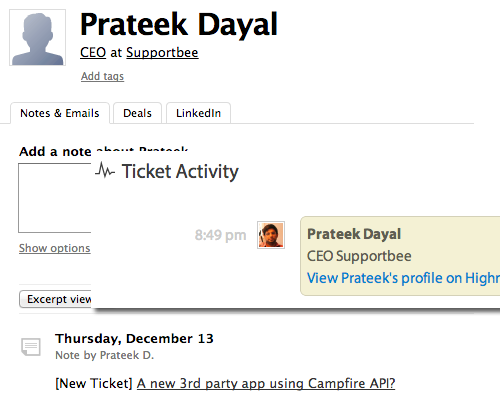 By default we only add a link to the SupportBee ticket. If you want the full content of the ticket to be posted to Highrise, please check this option. Once you add the integration, sit back and relax. You don't have to do anything manually. Every time a ticket comes in, we will automatically look in Highrise and post a comment on the ticket if we find a contact based on the email address. If we can't find one, we will create a contact if you have the option checked in settings.